A fair amount of Mac users have ditched the “All My Files” default Finder window option by setting new windows to open to the ~/ Home directory again, which was long the default in Mac OS X anyway. This is usually because All My Files is viewed as an overwhelming amalgamation of every single thing on your Mac dumped into a single folder, which, in fairness, that’s exactly what it is. 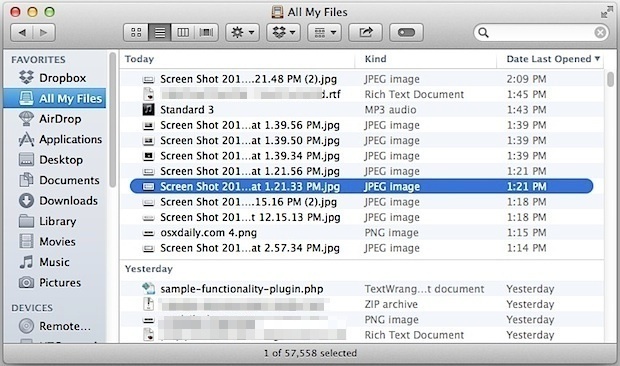 But All My files doesn’t have to be mess to look through, and a simple sorting toggle can transform the folder from a disaster to a productivity aid, offering quick access to all the most recently used and opened files on the Mac. 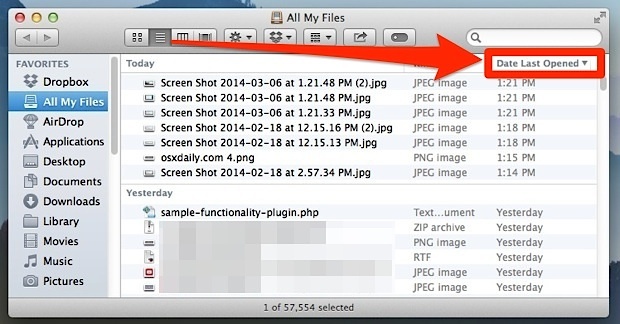 Let’s review a few quick adjustments which can make All My Files view a bit more useful to Mac users. 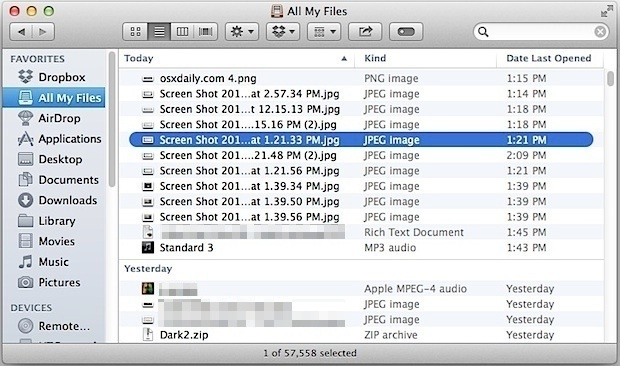 The “Date Last Opened” file arrangement view will split the ‘All My Files’ view into date categories, like “Today”, “Yesterday”, “Previous 7 Days”, “Previous 30 Days”, etc. In effect, this turns the All My Files folder into a folder of your active work, updating automatically based upon your file usage. This means if you’ve opened a group of files scattered around the hard drive, they’ll all appear at the top of this list, making them easy to locate again for future work. We covered a variety of this by sorting using the “Date Modified” setting to quickly access recent work too, but “Date Last Opened” is arguably even more useful because it’ll show files that were opened but not necessarily modified (modified being a file was edited and saved). Last Opened is just that, if a file was merely opened it will update to the top of the file list. You’ll be forgiven if you think to yourself “wait, didn’t I just do this?” in the first step, but it turns out that “Arrange” and “Sort” are two different things in the Finder, and despite both having a “Date Last Opened” name, they work a bit differently. Fortunately, they compliment each other very well, thus, we’re going to enable them both for All My Files. You’ll have to use the “List” view of Finder windows to get the sorting options available to you, then just click on the “Date Last Opened” option so that the triangle is pointing downwards, indicating that the most recently opened files will be listed first. 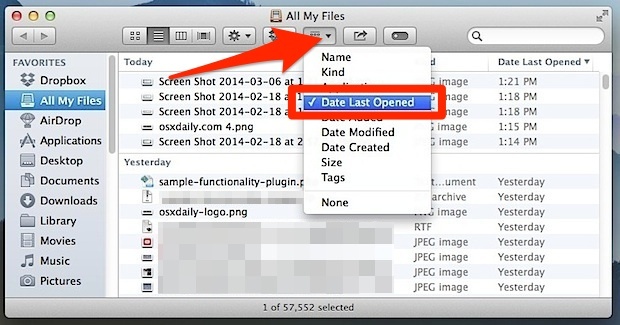 As a sorting option, “Date Last Opened” will place the most recently opened files at the very top of the already date arranged file lists, meaning if something was modified at 2PM it would show above a file modified at 10AM. Compare the two screen shots below to see how this sort option differs. This is why if you’re interested in accessing your most recently used documents, the former setting is usually preferable. It’s also just a handy way to see the last time a file was accessed in general, if you’re wondering when something was last modified, or if someone else took a peak at a document or two. All My Files is sooo slow to open. Date sorting is great but not when the folder takes 20 seconds to load! Apple does not care about OS X. For me, All Files is useless beyond description. The files I work on are code, text (as in MS Word or LibreOffice), and music (Logic X mainly). Apart from that, there are downloads to track. All Files opens with a list of images that I haven’t created nor used, PDFs that were downloaded quite some time ago, recent MP3/AAC files I’ve added to iTunes, and Movies, spread sheets and presentations that I don’t care about. My actual work files are out of sight. And it takes more than 10 seconds to open, thanks to the rather useless preview features. If I sort by date, it’s slightly more useful, but includes huge amounts of generated html files that I don’t want to see. I don’t know who the target audience for this feature is, but it isn’t me. This is a great hint, the default setting is worse than useless for the average Mac user / customer. I can see how this could be useful. Thanks! Great! It is really useful. Thanks! For me, “All my Files” is a pretty useless feature. I tried a couple times to configure it to fit my workflow, but it just doesn’t work for me. Does anyone else find that if they use the “Arrange by” feature in “All My Files”, then the “Sort by” option is greyed out when you ⌘-J “Show View Options”? This means that although items are grouped by e.g. Last Opened Date, I don’t get the little arrows at the top of each column, to let me “Sort by” e.g. Date last modified, as in the example above. It’s always been like this for me (I should say this is on 10.8.5… but why have the two check boxes in the ⌘-J view at all, if you can’t use them both?) The only time I can sort each column, is if I have “Arrange by” set to “None”. Anyone else get this, or found a way to enable both?